First it was Leon Sylvers…then Bluey…and then we continued on with Temperton. 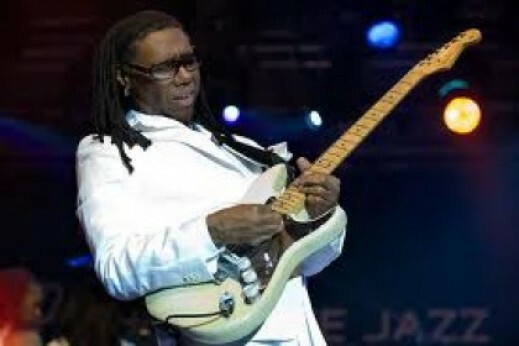 Now we can add a fourth one to the list of prolific writers/producers – Nile Rodgers.. I got the attention of Niles when Wayne A. pointed me to Walking On Planet C about a month ago, when Nile detailed about his bout with cancer. This got started my mind in a tailspin (as news like this always does), which prompted me to pull all of his music together and listen to him a bit more. Of course, pulling the music together of a man who has far-reaching influences took more than a little time. I had mentioned this to Greg S., one of the sharpest men on the west coast, and he ran with it. Not only did I get quite a bit of feedback, but he presented me with one his playlist specifically concentrating on Nile. which you see on Nile: One. This had the desired effect which to bring me out of anral funk and was a direct influence on Nine: Two, a list of my favorite tracks by him. Besides Chic, B-52s, Diana Ross, and Norma Jean Wright, you’re treated to Inxs, Out Loud, David Bowie, and Grace Jones. Please believe me when I tell you that a third one can be generated (and quite possibly a fourth). Enjoy, and expect to see more of him in 2011. As usual, I look forward to feedback Got requests? Send an email to ejflavors at gmail dot com. For those who’d like to subscribe to these podcasts, enter this link manually into iTunes. Also, please be sure to check out on GROOVMNT always keepin’ you in the loop. Take it light. There is some serious stuff going on here. And there is so much more. Thanks for a great post. Worth listening to over and over again! I never knew that Nile did David Bowie’s “China Girl”. Loved this song! I am amazed at his body of work with INXS, Madonnna, Duran Duran, B52’s. I never knew! Nile is the MAN!!!! He, Reggie Lucas and Jellybean hooked Madonna up. If you ever get a chance look up “Rock Bottom” of the album “Adventures In The Land Of The Good Groove”. I’m sure you will LOVE IT! My Brother put me on to it back in the day, when we had our late night music listening sessions. Good Times (wow..not even purposefully done) remembering Upside Down. Great memories. Great music. Classic. Well done Mr. Rodgers. Well done. If ever there was a comprehensive Niles retrospective, this is surely it. Well done, sir.